Sudan is doing everything it can to rid itself of the rebel forces in the Blue Nile area and the Nuba Mountains; this includes obliterating their base. Their base is the villagers who have been forced to gather in mountain hideouts or refugee camps. The bombings continue but so does the resistance, led by the rebel forces. Director, hajooj kuka was on the ground filming for over eighteen months, creating a film that traverses through the lives of displaced people who lost everything. Yet, instead of finding a devastated and defeated people we find a vibrant culture, people who have found new purpose and energy in the face of conflict. 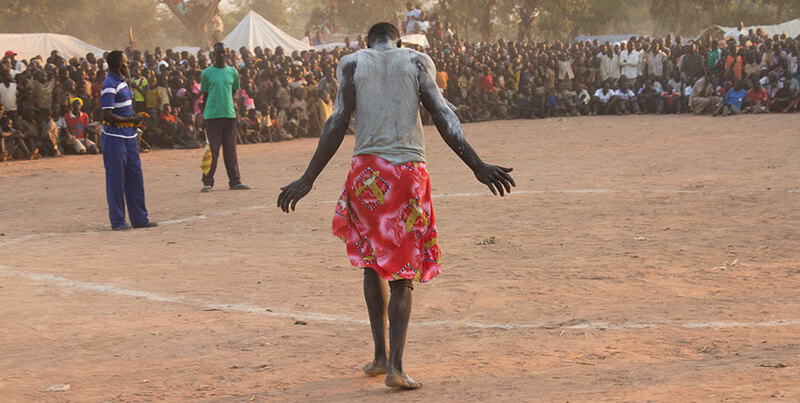 They responsd to the violence with singing, dancing, laughter and marvelous music that comes from the root of their culture. Through this journey we become aware of the Sudanese conflict that stems from a war on identity.